Super League and National Rugby League must come together to ensure the World Club Challenge reaches its potential as a "showcase" for the sport, says Sydney Roosters head coach Trent Robinson. 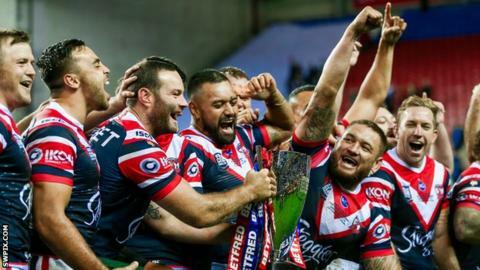 Roosters won 2019's meeting of the Super League and NRL champions, the 26th fixture between the hemispheres. However, the competition's future is yet to be cemented. "We have a discussion about it every year whether we should play it or not." Robinson told BBC Sport. "It is crazy." He added: "Let's get it organised, let's get it sorted and spend a few days talking about one of the greatest showcases we have in the World Club Challenge and how do we market it well and do it justice to both seasons. "Surely some people can talk about that over two or three days and get it sorted for the future." Robinson, 41, has a unique take on the competition, having previously coached Catalans Dragons in Super League and played league in Europe with Toulouse. His first experience of the World Club Challenge came in 2014, when Wigan headed for Sydney's now defunct Football Stadium and were beaten 36-14. Roosters half-back Cooper Cronk lent his support in the prelude to the game, highlighting its value to players. He played in two World Club Challenges at Melbourne, with Sunday's win his third appearance. "I love the concept, I want to be a part of it," Cronk, 35, said. "From my personal perspective, I think the game is locked in for the future whether Sunday's game is close, the best game that's ever been produced or even a blowout." Toronto Wolfpack back-rower Jon Wilkin helped St Helens win the competition against Brisbane Broncos in 2007 - one of the highlights from his 16-year spell with the Red Vee. "I think it is here to stay," he told BBC Radio 5 live. "It is weird that we question its validity as a game. "It is a massive game in the rugby league calendar and we just need to grow it. "We need our showpieces to continue to get better. The better they are the more potential we have for the game to grow. "I'm a fan of rethinking things, but the best team in Australia's NRL playing the best team in England's Super League, what is there to lose in this fixture? "It has to be well organised and well executed and credit to Wigan, they put on a great show." Although the scoreline suggests the Roosters were in control for the majority of the game, Wigan scored two impressive tries from uncapped wingers Tom Davies and Liam Marshall during spells on top. While both sides boast international and representative experience, players such as Joe Bullock - who was playing in the Championship last season - will benefit from the introduction to elite level rugby, according to England and Great Britain lock Sean O'Loughlin. "The experience the boys will take from playing a game like this bodes well for the season," he said. "If you don't have that taste of international rugby, you don't always get that feeling. "The more boys on the fringes who haven't touched on international rugby yet get to play in these games, the better. "It's not only good for those senior players who have tested it, but also the younger players who get to develop and test themselves against teams like the Roosters." Statistics do not bode well for the Super League in the past decade or so, as NRL teams have won nine of the past 11 contests with Leeds and Wigan bucking the trend in 2012 and 2017. However, much like Test football for the international nations, exposure to elite-level opposition for Super League players is seen as a way of developing and nurturing talent. There will always be an advantage for the southern hemisphere sides, given the financial muscle and depth available to them in comparison to their European counterparts. NRL teams have $9.1m to spend on their top 30 players, which translates to around £5.3m. "All the effort areas they got right," ex-Great Britain back-rower Wilkin added. "Wigan tried really hard. They didn't quite execute and weren't quite smart enough. "What a fantastic set of players and what a fantastic team the Sydney Roosters are. You have to look at the spend as well, the salary cap over here is £2m and it is nearly three or four times that in the NRL. "They have a superior bunch of athletes, they have the pick of hundreds of thousands of people that play the game. We pick from a very, very small pool of players. "For a town like Wigan to produce a world-class rugby team is incredible and St Helens and Warrington and others do it as well. From what resources we have as a sport, rugby league, we do fantastically well. Realistically until we can compete commercially and until we can compete with the number of kids playing, this (WCC loss) will be the case more often than not." The key to maintaining a healthy World Club Challenge going forward will be for the powerbrokers and stakeholders at the Super League and perhaps most importantly the NRL to agree on set concepts. With 28 clubs in total - 12 in Super League and another 16 in Australia and New Zealand - it will be down to the governing bodies and organisations to represent their member clubs for a mutually beneficial solution. Recently-appointed chief executive Robert Elstone has his thoughts on how the format can be developed going forward. "The clue is in the title, it is the best against the best," Elstone said. "That billing is eye-catching and puts Super League on the map. It's a concept with more value in it and I think if we really do get behind it and consider where we play it and what time of year we play it then it can be even bigger. "In my short time in the sport I've had nothing but support from the NRL, both from NRL itself and some of the leading clubs. They absolutely want to work with Super League on a number of initiatives and this will be one of them. "Naturally one thing we need to look at with the World Club Challenge is when we play it, and there is a nice logic to playing it the week after the Grand Final when it is the best European team going up against the best Australian team a week later. "There are some real challenges in that, logistics, where you play it, impact on the international and domestic programmes, but it is all part of the agenda we need to look at if we are going to make this concept as big as it can be."